They arrive on foot wearing tall rubber boots and faded army fatigues. Others appear on motorbikes, baseball hats pulled low against northern Cambodia’s steamy afternoon haze. They trickle in until 11 men and three women stand around a heavy wooden table or sit on rough-cut stump stools. They’re the community forest patrol of Kunpheap, a 734-person village in Cambodia’s vast Preah Vihear province, and it’s their 395-hectare forest they’ve gathered to protect. The night before, commune council member Kuch Sour heard the telltale buzz of a chainsaw in the nearby community forest — parcels of land recognized by the Cambodian government as usable by local residents for resin and other natural resource collection. It’s a sure sign of foul play, he said, as only those sourcing wood for new home construction are permitted to use one. Still, the rev of a chainsaw rips through the air almost daily. The village of Kunpheap sits in one of four provinces home to Prey Lang, a biologically diverse and threatened lowland evergreen forest sweeping across a vast segment of a northern Cambodia largely untouched by tourism. An estimated 250,000 people live in the 340 villages within or next to the forest, many of whom rely on the landscape for their livelihoods. The group of men and women preparing to set out on a several hour patrol in Kunpheap is just one of 41 community forest patrols supported by Winrock International that volunteer several hours a week to search out and expose anyone involved in tree harvesting, land clearing or wildlife poaching — all illegal acts that still take place regularly…. 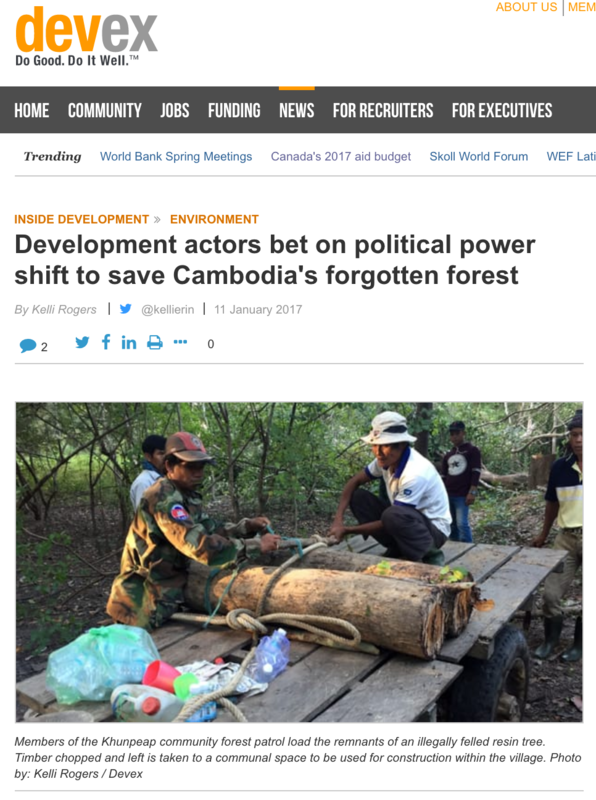 To read more of Devex’s story on how the USAID Cambodia Supporting Forests and Biodiversity (SFB) project is empowering communities to protect Cambodia’s amazing Prey Lang Forest, click here.